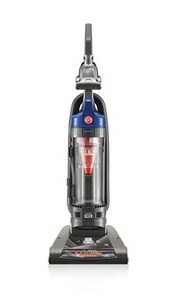 Pick up the debris you can't see with the Hoover® WindTunnel®2 High Capacity Bagless Upright. It's designed with exclusive WindTunnel® 2 Technology that lifts and removes deep down embedded dirt with 2 channels of suction. The WindTunnel® 2 High Capacity gives you excellent performance to tackle cleaning your home with features like a reusable, easy-rinse filter and includes a complete accessory pack to help clean your various cracks and crevices with precision. When you're done vacuuming, simply empty the debris with its convenient bottom-release high capacity (x-large) dirt cup straight in the trash without the hassle of changing or buying bags. Exclusive WindTunnel® 2 Technology WindTunnel® 2 Technology creates two channels of suction to lift and remove surface debris and deep down embedded dirt. Vacuums without WindTunnel® Technology rely on only one channel of suction. HEPA Media Filter made with HEPA media. HEPA media traps 99.97% of dirt, dust, and pollens down to 0.3 microns. Extension Wand Extends the reach of the hose. Turbo Tool Cleans furniture and stairs. Dusting Brush Cleans vents, furniture surfaces, and other decor. Above Floor Cleaning Up to 10 feet of cleaning reach.